Shas party chairman, Minister Aryeh Deri explains that “we are working together with Yahadut Hatorah, in complete cooperation. We will not enter into a government without Yahadut Hatorah and there is no need for unity between the parties, for we will all pass the minimum threshold, as I am certain Yahadut Hatorah will pass the minimum threshold”. He adds he has not seen any proof that they will receive additional seats if they run on a united list. He also warns that if all the chareidi parties are united, the non-religious votes that would go to Shas would be lost. 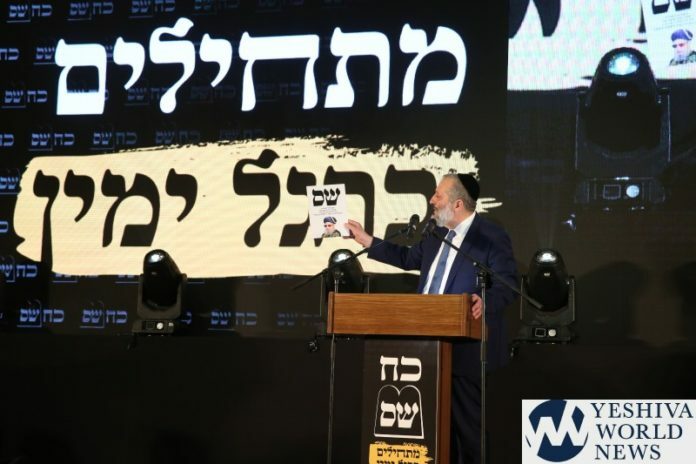 Shas Chairman Aryeh Deri on Monday, February 11, 2019, was interviewed at the 16th annual Jerusalem Conference. Deri adds that Prime Minister Binyamin Netanyahu is interested in chareidi unity, having seen recent polls that show Shas may or may not clear the minimum to enter Knesset, and Deri explained to him why he is not in favor, as at the end of the day, he is concerned with Shas and remains confident that Shas will enter Knesset on its own as it has in past elections. Shas throughout the years of its existence has succeeded and proved this even in the recent municipal elections. Kahlon and Orly Levy worry about Shabbos? “Our ticket is not just a social note but a note for Jewish tradition, education and all that in one note. Deri explained that he has been serving as a cabinet minister for a long time, and while there are younger politicians with ambition to become prime minister, he suggests for now to wait, as Mr. Netanyahu is the right person to serve as present and he will continue receiving Shas’ support.